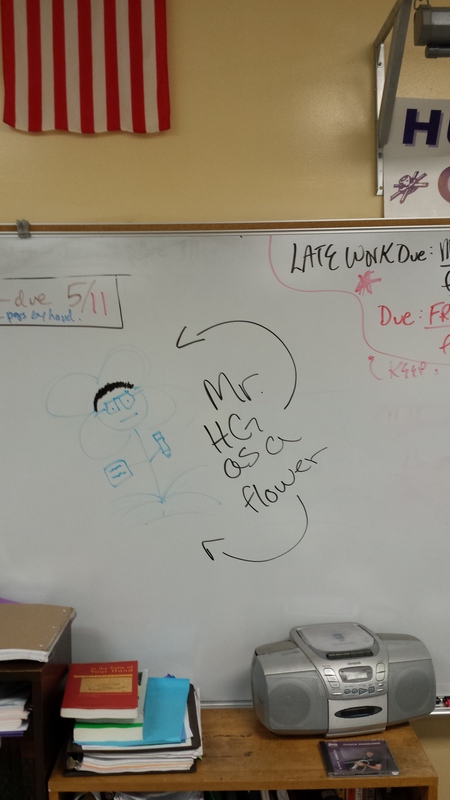 Some of my sophomore students drew me as a plant two weeks ago. Closer up, me as a flower. 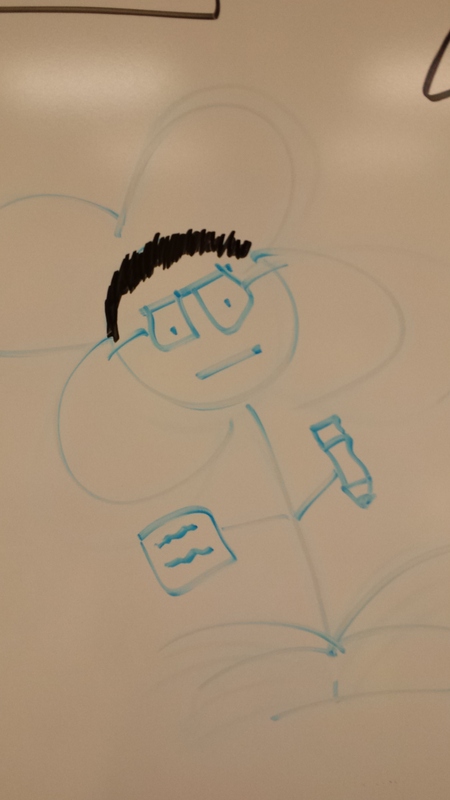 I’m pleased the students used the black (and not the “rapidly graying”) marker to depict my hair. “We were debating whether you were here or not. And then, as an evidentiary claim, you showed up,” I said to a student who arrived late to my 3rd hour class. “I was such a child back then,” said a senior girl in my creative writing class as she read through her journal. When, I asked. “January 14th,” she said. 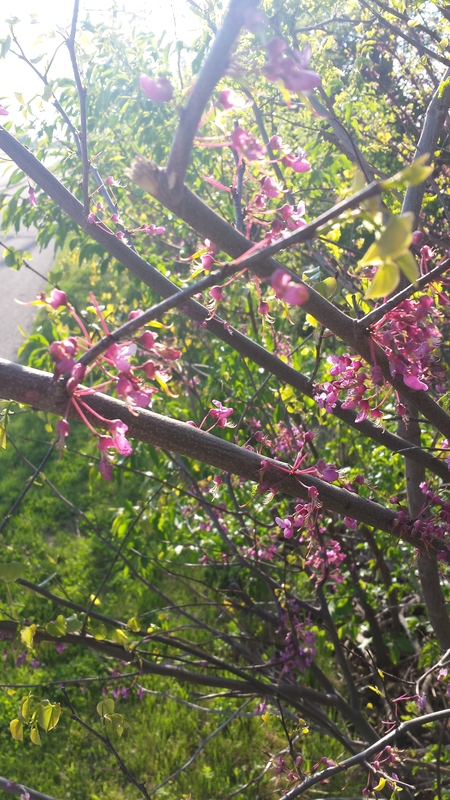 12 May 2015, Byron, IL, near walking path north of the high school. I heard a male teacher conversing in the school library with a female teacher say: “Are you getting vinyl? I’m getting wood.” After I said that was a quote worth writing down, they both said they were talking about fencing at their respective homes. On Mother’s Day, my mom cooked homemade vegetable patties for me. “Does this look like something you want more than one of?” she asked as she spatula’d one onto my plate. I did. “All I have to do is type the words,” said a student in my writing class explaining how he was going to get caught up on a semester’s worth of missing writing assignments in the last week of class. A student and I were counting up the number of days he’d been alive. Maybe he’d been dead for some of those days, he suggested. Being dead a minute, maybe, I said. “Being dead a day, it’s hard to come back from that,” I said. By the way, this student had been alive for his 6,714th day last Thursday. During 10th hour on 8 May, I mentioned to a couple students that I’d written many stories for my college French classes about a “marmotte,” because it was so close to its English equivalent “marmot.” After students left, I noticed all three computers where those students sat had had new pictures installed for backgrounds. “The chicks’ll cream” were the words in the “Greased Lightning” song played for teachers to dance to, in the teachers-versus-students dance-off at my school’s end-of-year assembly last Friday. Also at the assembly, in a separate dancing exhibition, the teacher leading three groups of seniors through some so-called “games” told them to perform a “native dance,” which involved students getting dressed up with what looked like Swiffer duster-sheets as headdresses and cones over their mouths. “Let’s see some indigenous movements,” she actually said. This entry was posted in From the pocket pages, Transcribed from life and tagged fun with lasers, getting wood, high school, high school life, indigenous movements, marmottes, me as flower, quotes, sophomores, students. Bookmark the permalink.